Yet as historian James Dempsey has shown, there were important elements of Blackfoot warrior culture that accompanied Blackfoot mobilization during the Great War. As the nineteenth-century waned, so too did opportunity for young men to prove themselves in battle, raid their enemy’s camps for horses, and recount their own victories on hides and in ceremonies. The First World War offered opportunity for young Blackfoot men who, despite the best attempts of missionaries and Indian agents, retained an understanding of what it was to be a warrior in the days of the buffalo. Yet in the days of chlorine gas, shellfire, and modernizing bureaucracy, there was much suffering to bracket moments of glory on the battlefield. Examination of Blackfoot experiences in the First World War reveals soldiers who could operate in and understand imperial, national, and indigenous worlds all at once. After much confusion on the part of the departments of Indian Affairs and the Militia, recruitment of indigenous people in Canada began in earnest in the spring of 1916. In late January 1917, Captain Norman S. Rankin of the 191st Battalion promised that if enough Siksika men enlisted they would form a platoon under indigenous command. Fourteen men went to Calgary to volunteer, but only eight of them were deemed medically fit. Of the young men of the Siksika, only Mike Foxhead served overseas. He was killed in action during the Battle of Passchendaele. Nevertheless, the rejected and discharged Siksika men reportedly sang “It’s a long way to Tipperary” as they returned to the reserve. 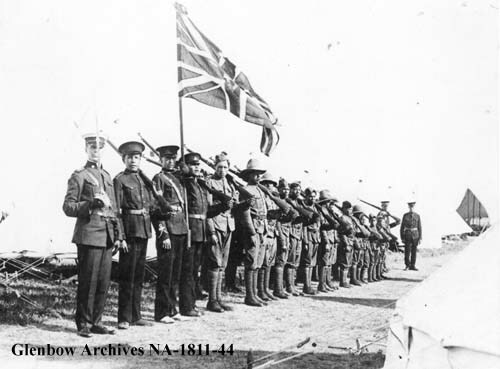 Some twenty-nine First Nations men from Alberta enlisted, including seventeen from the Kainai reserve. Mike Foxhead (seated), 1916. Foxhead enlisted with the 191st Battalion in 1916 and served with the 50th Battalion of the Canadian Expeditionary Force. He was killed by a sniper in October 1917 during the Battle of Passchendaele. Glenbow Archives NA-5-16. Perhaps the most well-known Kainai soldiers are the Mountain Horse brothers. Joe, Albert and Mike were graduates of St. Paul’s Anglican Boarding School and participated in its cadet program. It seems that the Reverend Samuel Middleton, principal there from 1909-49, was particularly devoted to a martial vision of the British Empire. The cadet corps introduced young men to uniforms, drill and marksmanship. Aside from preparing them for military service, such skills stood men in good stead to work as scouts or translators with the North-West Mounted Police. Canon Middleton facilitated their placement there. His 1931 recommendation letter for Harvey Tail Feathers noted the young man was a sergeant in the cadet corps, an athlete, and played the cornet. Both Joe and Mike Mountain Horse worked for the Mounties. Joe Mountain Horse served with the Northwest Mounted Police before the First World War. Overseas he served with the 50th Battalion and was injured numerous times suffering a life-long disability as a result. Glenbow Archives NC-7-69. Joe Mountain Horse, being awarded medal at McLeod after return from World War, 1914 – 1918. Provincial Archives of Alberta, P198. The pages of the register at St. Paul’s at the Glenbow Archives do not contain many details on the pupils, often just listing the bands they came from, or recording notes on their health if it was poor (as it was for many), but they do proudly list details of service in the military and cadets. The institution had a long impact in indoctrinating Blackfoot in Anglo-Canadian martial culture. In the 1920s, some veterans like Nick King and Joseph Mountain Horse signed their own children up in the school, and in the Second World War, a number of former St. Paul’s cadets served in the armed forces. Kainai Recruits of the St. Paul’s Anglican Boarding School, July 1912. Glenbow Archives NA-1811-44. Despite these connections to St. Paul’s School, its graduates were certainly not simply products of assimilation who had removed themselves from the Kainai worldview. British imperial militarism coexisted and blended with Blackfoot ways of knowing. Mike Mountain Horse was to write, “it must be confessed that the powerful sway of the new was not sufficient to entirely dethrone the many spirits to whom we had previously made our offerings.” A major aspect of his memoir, My People the Bloods, was a hope to set the record straight on Blackfoot culture. When Mike’s brother, Albert Mountain Horse died of sickness after fighting at the Battle of 2nd Ypres, Mike recalled that a spirit of revenge which he associated with his forefathers motivated him to enlist. Mike remembered letting out his own war song during a particularly frustrating period in the trenches overseas and later had his war exploits recorded on a hide, much like his ancestors. Other material displays of indigeneity included George Strangling Wolf’s modified uniform at Sarcee Camp, replete with elk teeth earrings and necklace. Strangling Wolf was to be gassed at Lens in 1917 and sent home. Private Nick King of the 50th Battalion, a graduate of St. Joseph’s Industrial School, brought his traditional regalia overseas with him and wished to bring his own beaded jacket overseas to France. His father, Bumble Bee had attempted to enlist as well, but he refused to cut his hair, and was struck off strength. Mike Mountain Horse recalled that during the, “dark days of 1917 when the Germans were having things pretty much their own way”, George Strangling Wolf made an offering of a small portion of his skin, praying, “Help me, Sun, to survive this terrible war, that I may meet my relatives again. With this request, I offer you my body as food,” and buried a piece of flesh cut from near his knee. Self-mortification, the cutting of a piece of flesh, was a ritual that had long been performed at the sun dance, a ceremony central to the Blackfoot way of life. Kainai and Siksika recruits of the 191st Battalion. L-R Back Row: George Coming Singer; Joe Crow Chief; Dave Mills; George Strangling Wolf; Mike Foxhead, [Blackfoot, died overseas], 1919. L-R front row: Nick King; Harold Chief Moon; Lt. Col. Bryan; Joe Mountain Horse; Mike Mountain Horse. Glenbow Archives NA-2164-1. Private Nick King of the 50th Battalion, 1916. Provincial Archives of Alberta A21175. 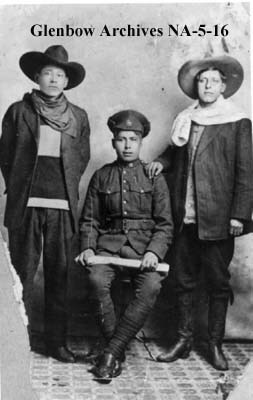 Despite the attempts of residential schools to assimilate Niitsitapi children into Euro-Canadian culture, the experiences of First World War Blackfoot soldiers suggest that their indigenous culture was by no means erased. The young men that volunteered to fight in the First World War understood the world of Union Jacks and khaki, but also interpreted this world and their place in it through Blackfoot ways of knowing. “Pte. Mike Foxhead Writes From England,” Gleichen Call, 16 August, 1917, p. 1. L.J. Dempsey, Warriors of the King: Prairie Indians in World War I, Canadian Plains Studies (Canadian Plains Research Center, University of Regina, 1999); James Dempsey, “A Warrior’s Robe,” Alberta History 51, no. 4 (October 2003): 18–22. “Blackfeet Indians Volunteer to Fight our Fight for Us,” Gleichen Call, 1 February 1917, p. 1. P. Whitney Lackenbauer et al., A Commemorative History of Aboriginal People in the Canadian Military (Ottawa: Department of National Defence, 2009), 125. Middleton to Christen Junget, Major, K Divisions, RCMP, Lethbridge, 8 December 1931. Canon Samuel Middleton Fonds, “General Correspondence, 1916-61”, Glenbow Museum Archives M839-5. Mike Mountain Horse and Hugh Aylmer Dempsey, My People the Bloods (Calgary: Glenbow-Alberta Institute; Blood Tribal Council, 1979), 18. Mountain Horse and Dempsey, 140. Mountain Horse and Dempsey, 30. Mountain Horse and Dempsey, 141. Company Sergeant Major Mills, Calgary, to Indian Agent Blood Reserve, McLeod, 20 July 1918. Folder no 121: “Blood Indian agency Correspondence, etc 1918-1919”, Blood Indian Agency Fonds, Glenbow Museum Archives. Mountain Horse and Dempsey, My People the Bloods, 75. Blanca Tovias, Colonialism on the Prairies: Blackfoot Settlement and Cultural Transformation, 1870-1920 (Thornhill: Sussex Academic Press, 2011), 23.